The Mesh Components node renders vertices, faces, triangles, edges and other components with index values. Load one of more model in the Scene Window. Drag the Mesh Components icon into the Node Graph. Adjust the attributes of the Mesh Components node to modify it. Scene Limits the rendered mesh to the defined scene, or all if Any. Object Limits the rendered mesh to the defined objects in the scene, or all if Any. Material Renders the rendered mesh to the defined material id, or all if Any. 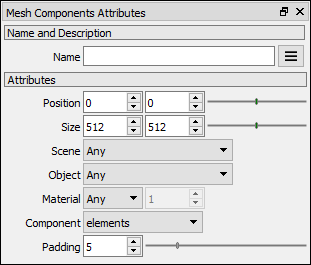 Component The component to be rendered, each with a different index value: elements: The elements of the mesh. Also known as connected meshes. uvelements: The uv elements of the mesh. Also known as connected uv meshes or uv islands. polygons: The polygons of the mesh. triangles: The triangles of the mesh. The triangles are the smallest renderable mesh component. borders: The edges of the mesh that are shared by only one polygon. uvborders: The edges of the uv mesh that are shared by only one uv polygon. edges: The edges of the mesh. hardedges: The edges of the mesh that are not smooth (render normals). visibleedges: The edges of the mesh that have a visibility flag. invisible_edges: The edges of the mesh that don't have a visibility flag. verts: The vertices of the mesh. Padding The size of the region of pixels around the rendered components.